2-So, if this Delphic exhibition is marble, the next question is how to protect Brown Fantasy Marble countertop from getting not stained? As long as you seal it properly and clean it with appropriate products, your hard marble will be alive. She can carry the hot pans and pots on it if you do not let them cool down. Brown Fantasy hard marble countertop is one of the no maintenance countertop in kitchen remodeling with almost zero complaints. Hard Marble Brown Fantasy is a heart melting stone by consisting of very soft colors. Her veins are amazingly distributed all around the surface. Some bold veins and some soft shadow looking veins are all mixed up. The whole picture reminds me the wonder of the world. Her pattern is called flowing pattern. The color scale is very wide and it comes with apricot, pewter, chestnut, white, green, gray and tan tones. 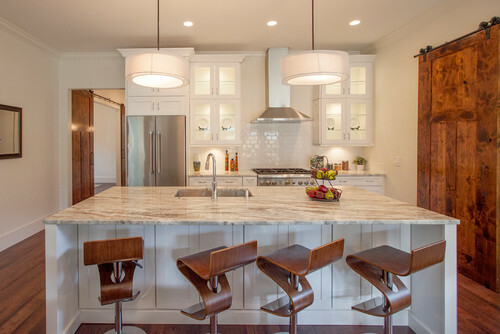 The best thing about flowing pattern countertops is taking part of every design style. Even in commercial or industrial looking modern kitchen, her elegance is visible if there is natural light and excess kitchen lighting available. Usually the keen eyed designers would like to have her in two-tone kitchen. Either two-tone countertop kitchen ideas or two-tone cabinets kitchen ideas carry Brown Fantasy well. She shows her beauty in more sophisticated way if leathered polish is used on her surface. 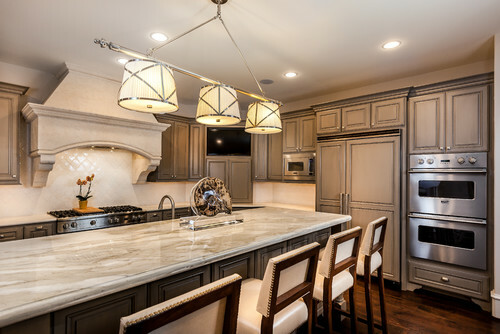 The perfect pairing cabinets with Brown Fantasy is white cabinets, light color cabinets, gray cabinets, walnut stained or espresso stained cabinets. Backsplash will be combined with the any color what Hard Marble Brown Fantasy has. For my opinion, grey backsplash, white, golden tones and earth tone backsplash are the good additions to kitchen remodeling ideas. Darker tone flooring is preferable when the off white or crisp clean white cabinets are picked. Please help to speak your mind and please drop a comment for hard marble Brown Fantasy countertop in pictures below that have been selected meticulously for your review. Picture Credit: Cyrilla Home via Houzz.,Polished travertine herringbone backsplash,Brown fantasy countertop and light gray kitchen cabinets combined well with benjamin moore Arroyo Red 2085-10 flooring and benjamin moore La Paloma Gray 1551 wall color. Fresh looking transitional kitchen. This kitchen makes my mood up. Picture Credit: Stoneshop, These Brown Fantasy Leathered hard marble countertop and island top are the star of this kitchen. With sweeping hues of brown, tan, gray, and white, the movement in this natural stone carries your eye throughout the space. Backsplash field tile is Glazzio’s C-14 Silver Spring 4” x 12”. The insert is Glazzio’s GS-21 Rustic Taupe mosaic. I think cabinet colors are antique white but I will come up with the details. Picture credit: Mike Schaap Builders, Combining the rustic taste with warm tone traditional kitchen design, this kitchen is a very inspiring example of having all design elements. Polished Fantasy Brown Countertop and Island top are the fine selection to match with the Graham Paint 8180W Almond White Kitchen Cabinets. Hardwood flooring is 4″ Hickory – Character Grade in a driftwood shade. Backsplash Field Tile – The Tin Man Victorian No. 6-09 Ivory Steel Finish brick , 2’4′ Sheet Range Hood Accent – Tile Sonoma Tilemakers Vitners Reserve Arch Herringbone Clove 1×2 Brick Arch Brick Herringbone and Sonoma Tilemakers Vitners Reserve Panache Clove 3/4″ x 8″. Designers was imbued with strong sense of duty. Hats off design. Picture Credit: Creative Cabinets. and its team; Photographer: Brendon Pinola, Designer: Jennifer Thompson, CKD Contractor: Lovette Construction. Dove Gray kitchen cabinets. The island is the same door style, but in a coffee finish. The island top is called Fantasy Brown. The perimeter tops are Caesarstone-London Gray 5000. Backsplash is 3×6 Mountain Mist Bevel Gray subway. Trendy designers make this kitchen a grey kitchen. Two-tone countertop and two-tone cabinets are perfectly inserted into the transitional kitchen. 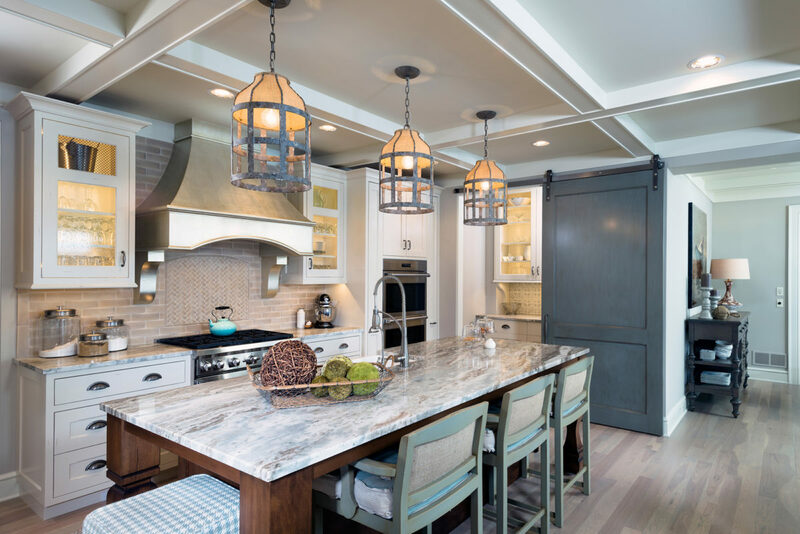 Picture Credit: Fortis Enterprises LLC., Brown Fantasy Countertop and island top are in good hands by combining the rustic and contemporary taste in a transitional kitchen. Kitchen Backsplash: 3×6 white subway, Tile Flooring: distressed rustic pine, Cabinet Color: linen, white kitchen cabinetry gives a fresh looking to this lovely kitchen…. Lighting, modern bar stools and sliding rustic farm door are big bonus for my spoiled followers. Picture Credit:Frankel Building Group, Polished Brown Fantasy with diagonal set up square white backsplash, hickory flooring, stainless steel appliance with gray cabinetry. Flexible countertops are always very popular with any kitchen design ideas. 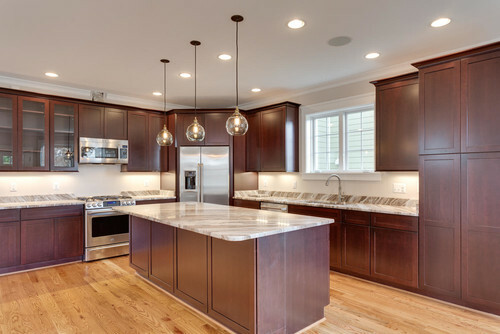 Picture Credit: Granite Works Countertops, Sweet hot chocolate colored brown cabinets with brown fantasy countertop. Color combination is completed with the good selection of the hardwood flooring. It was very hard to recognize for me but Oak & Board put my doubting mind away by recognizing the hardwood floor: Plain Sawn Red Oak site finished .